Aashish Gadhvi analyses the so-called defector in the Northern ranks. North Korea’s qualification for the 2010 World Cup has brought about many questions in international football. Not least of all, the desire for more information about the team. Most of all, who are these guys? The mystery surrounding the team is pretty much the same level of mystery which surrounds the country itself. Even the most adamant of football fans, such as myself, struggle to find any information about the North Korean team. However, there is one guy who sticks out like a sore thumb. Jong Tae-se, remember the name, is one of a very few players in the North Korean team who doesn’t play in the North, but his tale is a very intriguing one, even to the neutral. 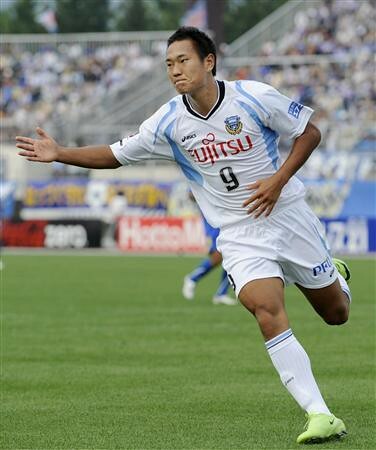 Jong Tae-se is a 25-year-old striker who plays for Kawasaki Frontale in the J-League, Japan’s premier division. He is a powerful lad, who can score goals and hold the ball up, something which Asian players have had trouble doing, but then again Jong Tae-se is no ordinary Asian lad. Born in Japan in 1984, Jong’s parents were South Koreans, although other sources have suggested that they were from the North. Jong as a youngster was educated in North Korean state-funded schools in Japan. Any of you who have seen the Japanese movie GO! would be familiar with these kind of schools. There are a few in Japan, but the few that do exist preach very much in the vein of schools in the North, i.e. loving the Dear Leader. This education no doubt helped to fuel Jong’s pro-North attitude. Little else is known about the youngster’s days in education except that he continued to go to North Korean state-sponsored schools, and started a love affair with the beautiful game. Many of the stories which surround his national allegiance are just that – stories, but the general consensus goes like this. 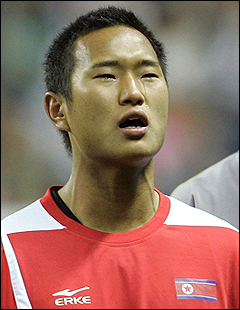 While watching North Korea’s defeat to Japan, thus failing to qualify for the 2006 World Cup, Jong was stirred inside, and finally decided that he wished to represent North Korea as his national team. Having always felt like a North Korean, Jong had made attempts to change his nationality and renounce his South Korean citizenship (inherited from his parents) but the request was turned down due to the South failing to acknowledge the North as a legitimate state. But with the help of some North Korean organizations in Japan, he was successfully allowed to have a North Korean passport. Through some loop holes in FIFA’s dual-citizenship laws, Jong was allowed to play for the North, although this no doubt is a very confusing area. Nevertheless Jong was allowed to represent the country that he wanted to represent. What he and his parents must have thought at the time can only be left to the imagination. Whatever the political consequences of effectively defecting to the North are, it did not effect Jong’s performance on the pitch: it rather boosted his play. In his first two games for North Korea, Jong scored an incredible 8 goals, 4 in both matches, although they were against Mongolia and Macau! This was followed up with scoring against both Japan and South Korea in the 2008 East Asia Cup. Both of the goals he scored displayed his power, and in the case of the goal against the South, effortlessly shrugged off two defenders to chip the goalkeeper. But sadly for Jong, that’s where the goals ended. During the entire 2010 World Cup qualifiers (a total of 11 games) he only scored once, and that too in a 2-1 loss to Iran. Due to the lack of footage I have seen of Jong, I can only imagine that his primary job is probably to use his strength to hold the ball up as a lone striker. The fact that North Korea qualified with 7 draws in total throughout the campaign while Jong was playing seems to point to that conclusion. Perhaps one of the best traits of Jong is that he is not afraid to give interviews. More importantly he is not afraid to express his opinions. In the past he has blasted his teammates for lack of effort and was one of the only players who came out and openly stated he had experienced great illness after the North accused the South of intentional food poisoning before their match up in Seoul. Whatever secrets still exist about the North, players like Jong are slowly lifting up the iron curtain, but one can only speculate how he will get on under the magnifying glass of football’s biggest stage in South Africa. Don’t forget: South Korea takes on Serbia at Craven Cottage next week, 18 November, 2:30pm. Remembering Murder: from "Memories of Murder" to "Mother"